This is a Jamie Oliver recipe and couldn’t be easier because you don’t need to faff with potato or egg wash.
You will need a food processor or be very diligent at chopping. Firstly take the crusts off your bread and whizz them to breadcrumbs. Set aside on a large plate. Take a tablespoon or two of the crumbs and put them back in your food processor. Chop the parsley and put it in the processor. Grate the zest off the lemon and add that too. Add salt and pepper, and your chosen fish combo. Whizz to a chunky gloop. Tip the lot onto a chopping board. Here’s a tip: to divide it easily mould it into a large round cake. Now slice your cake into four and four again like a Union Jack. Take each slice and mould it into a burger shape. You should have eight of equal size. Roll them in the breadcrumbs and pat them to stick. If you have time, put them all on a plate in the fridge to rest for 30 minutes, that helps stop them falling apart. Now heat oil in a frying pan, about 1cm deep. Heat it so a cube cut from one of your spare crusts goes crispy golden brown in 30 seconds (but not burnt nut brown!). 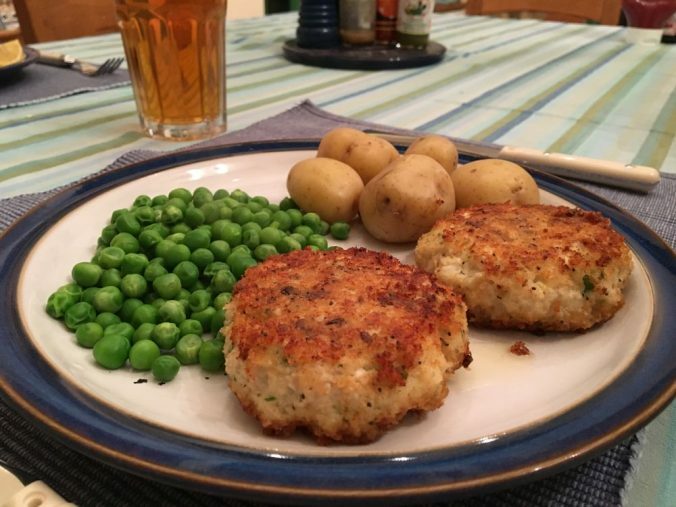 Now add your fishcakes. You may need to play with the heat controls so it cooks them without burning. After 5-8 minutes turn them over and give them another five on the other side. Hopefully the side you see will be not pale, not black but golden brown. When cooked through, drain on kitchen towel and serve with your favourite accompaniments. In my opinion new potatoes and peas are hard to beat.